I have long been a fan of black, gray, white and just a touch of red. This “Mosaic Madness” card shows this absolute favorite color combination! Although it is hard to tell in the pictures, the black cs is embossed with the new Modern Mosaic Embossing Folder. The mosaic images are stamped in Basic Gray and Going Gray, and are punched out with the new Mosaic Punch. The little quatrefoil images are punched with the matching Itty Bitty Shapes Punch. 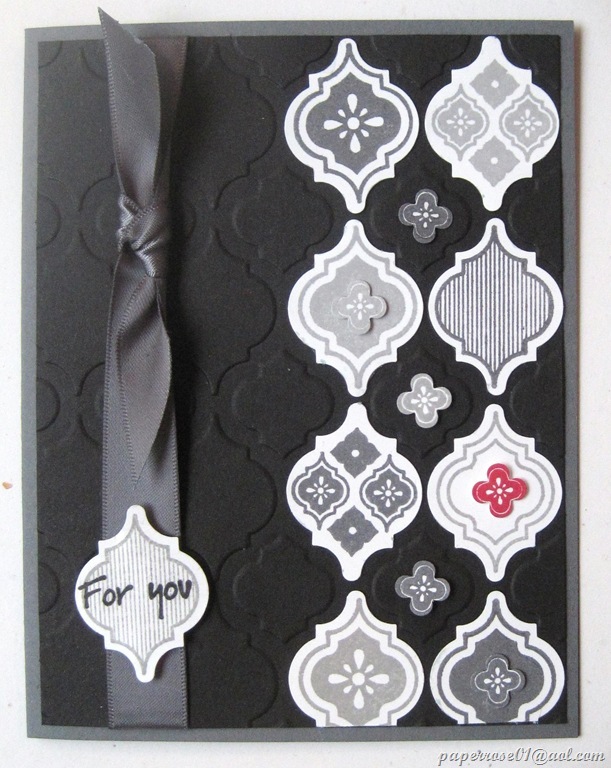 The 5/8” Basic Gray satin ribbon adds a touch of elegance to this simple card. 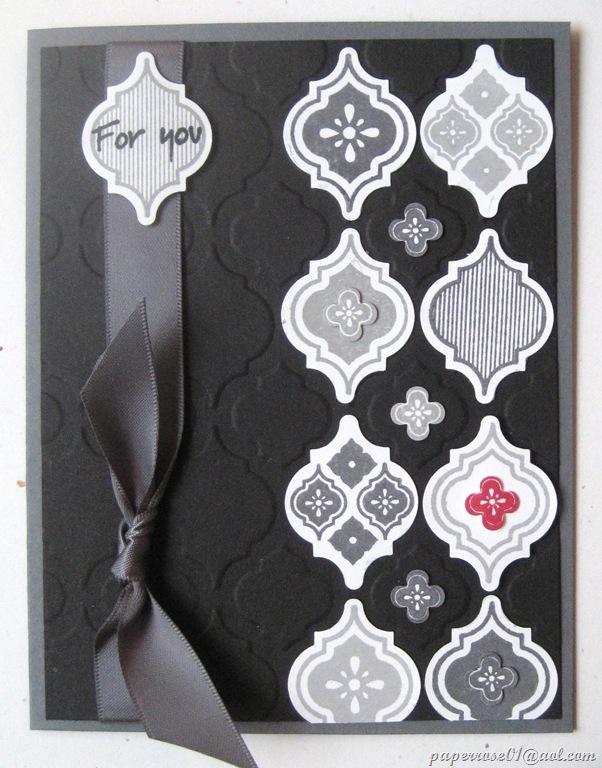 We’ve used the new Smoky Slate cs on the inside of the card for your message of choice. Another nice touch with this card is that it is EASY! You will be done in no time – especially if I have most of the mosaic images pre-stamped for you! 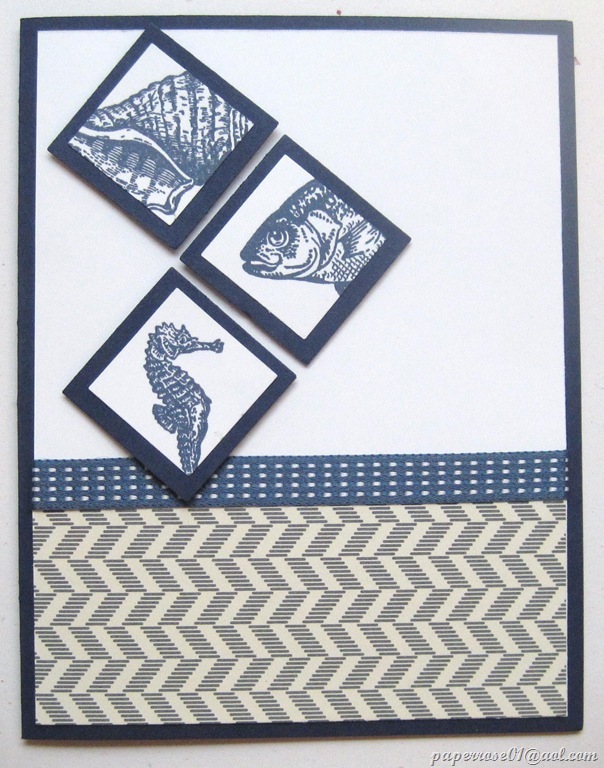 Our final Mostly Male card is By The Tide. I know we used this stamp set several months ago, but this card is vastly different. Deb did 2 versions, both in Night of Navy – 1 version uses DSP and the other has a bit more stamping. Of course the DSP card is the faster of the two, but I really like the stamped version although Deb says it is hard to keep the stamping straight – which I think calls for use of the Stamp-A-Ma-Jig! We didn’t add a message to the front, but there is plenty of room to add Navy of Navy text such as “Happy Birthday,” “Celebrate,” Happy Father’s Day,” or any other message. 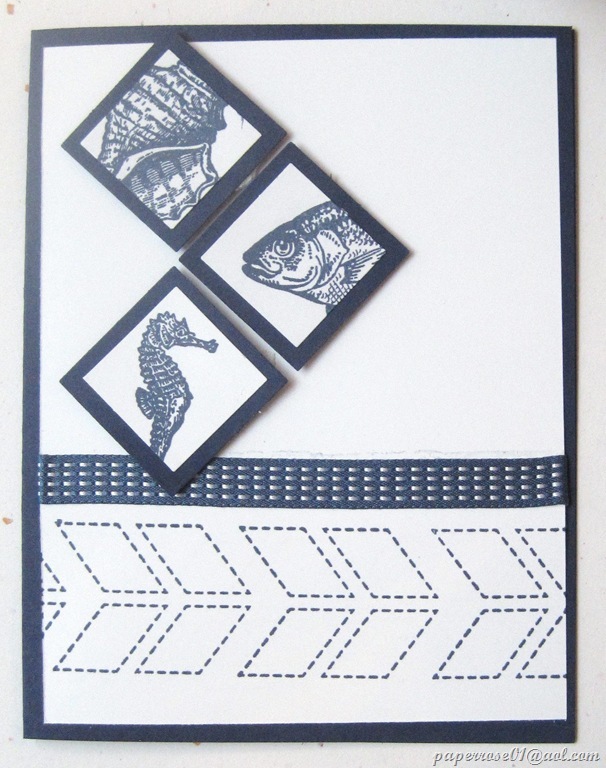 Square punches help make this stately card quick and easy! I hope you can make it this weekend! As I mentioned yesterday, now that I am retired, I no longer have to stick to the Friday 4 – 9 PM and Saturday 9AM – 4 PM time/day restraints. I know many of you have summer things on the weekends, so if you can make it on Wednesday, June 5th, or Thursday, June 6th, just let me know what day and time are best for you. The cost for June Mostly Male Stamp Camp is $10.00. And don’t forget that the new catalogs are in. Like last year, I am not charging for the catalogs. You can stop by and pick one up, or I can drop one by. I posted the E-mail links in yesterday’s blog. Just let me know what works for you. As I have mentioned previously, we will not have stamp camp in July – and I’m still not sure about August, but I will let you know in plenty of time. I will keep you posted of specials as they occur, and please let me know if there is something you need or if you have a stamping/paper crafting question.